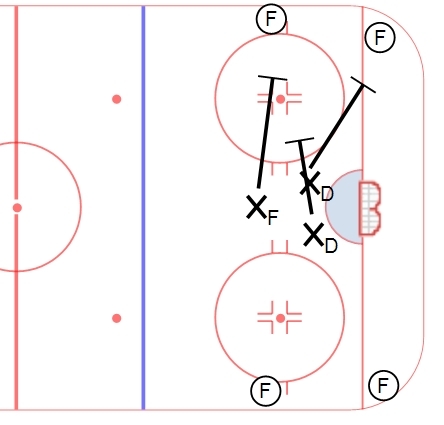 A simple defensive drill that works on outnumbering the puck and teaching players to anticipate plays down low. Three defensive players start at the net front (typically 2 D and 1 F). Two forwards start with a puck on both walls – they can be facing the wall, facing out, vary positioning to change skills worked on. On the whistle, the three defensive players sprint to defensive positioning and play an outnumbering situation, 3v2. Typically speaking, the first player on the puck is taught to hit and pin into the wall, the second man is looking to take the available play away (anticipate the pass to the partner and go right to him) and the third defensive player is looking to come in and take the puck. Once one side goes, the whistle blows and the same three players expand to the other side of the ice. The offensive players are trying to protect the puck and challenge the defensive players to outnumber and take it away. We use this drill to teach defensive concepts – hitting, pinning, anticipating options, quickly attacking and outnumbering on the defensive side of the puck. Can be done in one end or both depending on numbers.